Active metadata is the assemblage of metadata and annotations that is used actively within the project or process that generates it and is capable of being reused within that project or by another process. 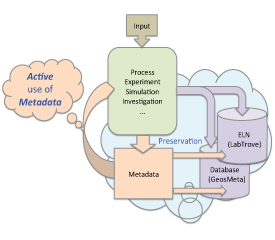 To preserve the metadata is a repository, such as a database or an ELN (Electronic Laboratory Notebook), enabling that metadata subsequently to be reused or to be extracted by another process, which might be run by a different researcher. However, it is important to note that we are not expounding a special class of metadata: we are instead exploring how to ensure that our prevailing metadata means more. Although we consider the concept of active use to be applicable to a broad range of contexts, we began our study by assembling collections of data records supplied by CREAM partners with the Annalist tool, developed by Graham Klyne (NineByNine). Drawing on the lessons learned from this preliminary work, Graham, working with other partners, has explored several applications in greater detail. We believe that Annalist has been useful for experimenting with and modelling existing metadata, but unless it is also being used for actual data collection processes, we now think we will probably need to complement Annalist with tools for active metadata capture that are closely coupled with tools used for the actual research or creative process concerned. 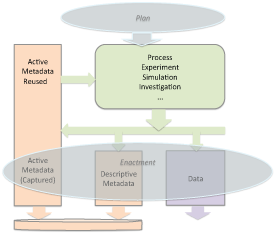 The first of our four goals is to “Create guidelines and exemplars to demonstrate how active metadata can make research more effective, agile and timely for researchers.” To achieve this goal, we intend to examine user tasks that entail the use of active metadata and use the information we glean to produce a structural framework for the guidelines. The framework will cover all the areas that we believe to be important in enabling researchers to make their research more effective, agile and timely.